Nothing says “fall is here!” like a mug of warm pumpkin spice latte goodness. But all that goodness usually comes with not-so-good ingredients like sugar, fat, and other additives. 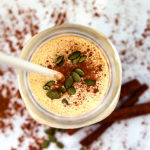 Now you can savor the taste of fall with a boost of nutrition — all you need is almond milk, ice, a little pumpkin pie spice, Vanilla Vegan Shakeology (or Vanilla Shakeology) and Café Latte Vegan Shakeology. Savor the taste of fall with a boost of nutrition — all you need is almond milk, ice, a little pumpkin pie spice, Vanilla Vegan Shakeology (or Vanilla Shakeology) and Café Latte Vegan Shakeology. Place almond milk, ice, Shakeology, and pumpkin pie spice in blender; cover. Blend until smooth. A great snack(tional) or enjoy as part of breakfast.